In 1916 a consolidation of eleven rural schools was effected, one of which was located in the village of Chazy and the others within a five mile radius thereof. The purpose of this plan, was to give to the children of the community all educational advantages to be obtained in any city school system. With this end in view, a building, modern in every particular and beautiful in all details, was erected and opened for use on November 14, 1916. The school maintains an elementary department consisting of the eight grades, a four-year high school course, and the following special departments: Agriculture, Industrial Arts, Household Arts, Library, Music, and Physical Training. The children have also the advantage of expert medical and dental service without charge. 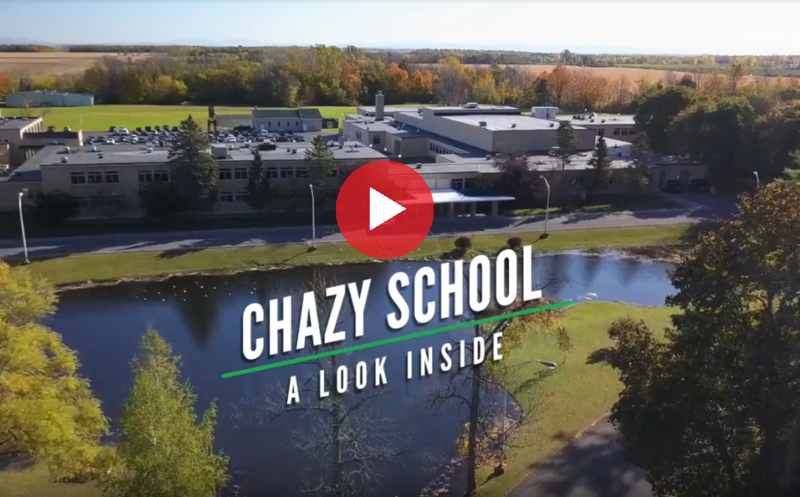 The new school was a marvel for Chazy and was soon recognized throughout the world as an extraordinary school for a town of 800 inhabitants. 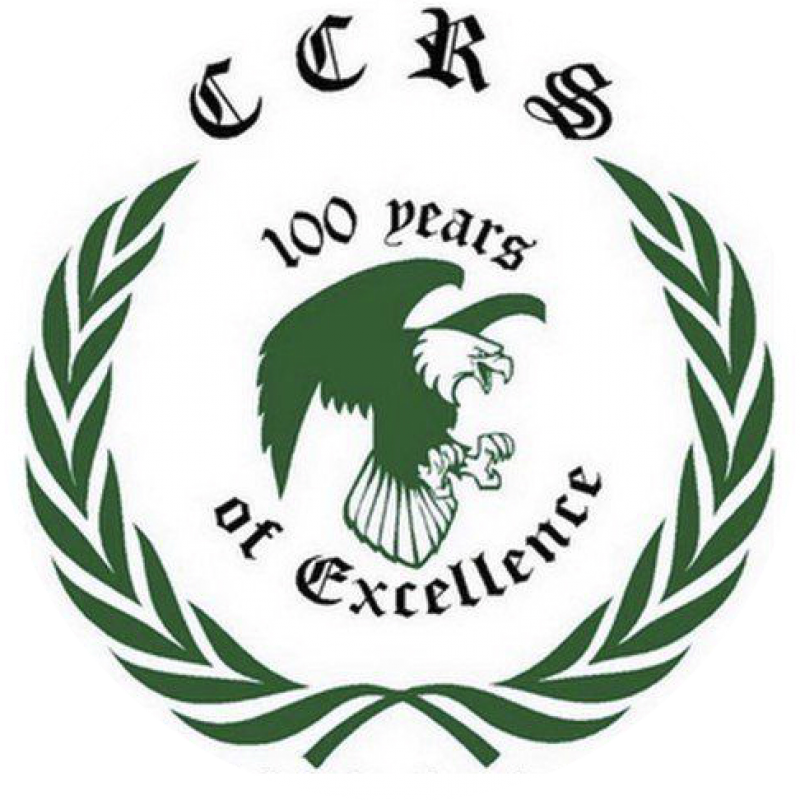 It was exhibited to 30 educators on invitation of the Board of Regents on September 19th 1917. It was not only well equipped to provide for Chazy youth an education equivalent to that received by city children, but it was elegant enough to be an inspiration even to the most jaded citizen. It rose five stories and surrounded a bell tower about 71 feet higher than its roof. The tower held a carillon of 40 tons of brass bells and the four faces of a great striking clock, each face eleven feet across. Among its 44 rooms were some of particular note, the high school English room, called the Shakespeare Room, was paneled in mahogany veneer in the Tudor style and had a working fireplace embellished with shields and gargoyles; the language room, named the Cicero Room, was paneled in white enameled wood and held plaster statues of Hebe and Diane in niches and a columned altar of a classic temple. There was an auditorium capable of seating 1100 people, when its side doors into the gymnasium were folded back, which had a stage fully equipped with lights, curtains, and scenery. There were two gymnasiums and two swimming pools, 22 by 60 feet, for boys and for girls, and a splendid board room paneled in mahogany and carpeted with an Oriental rug. An Otis elevator capable of carrying 50 children rose from the basement to the fifth floor where there were two lunch rooms equipped with marble topped tables. Each classroom was connected to a vacuum pipe for cleaning erasers and dust mops. There were fully equipped nurse’s and dentist’s offices, and a bell at the front door so that the dentist, who lived in the building, could be summoned at any time by an ailing citizen of Chazy. Further, the Italian marble walls of the entrance hall each bore a bronze plaque modeled by John Paulding of Chicago; each of the swimming pools had a bronze, life-sized figure of a boy or a girl by sculptor John L. Rea of Beekmantown. The asbestos curtain of the stage carried a view of the discovery of Lake Champlain painted by Frederick M. Mulhaupt of New York, and the stage was surmounted by The Old and The New Agriculture, a mural painted by George B. Bridgman, also of New York. To the front and below the stage of the auditorium was teh keyboard of one of the largest pipe organs in the state, a Welte Philharmonic that would play both manually and with rolls. The organ had great swell, choir, and echo organs, 2800 pipes and 58 stops. Reprinted with permission from A History of Chazy by Mrs. Benjamin F. Sullivan and Mr. David Kendall Martin.